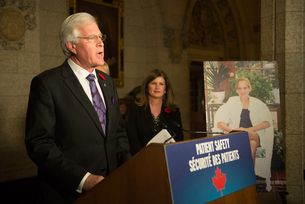 Ontario's “Vanessa’s Law” is probably the most powerful piece of medical legislation in Canada. In 2013, Terence Young, Member of Parliament for Oakville, Ontario introduced the Protecting Canadians from Unsafe Drugs Act (Bill C-17 or Vanessa's Law), which has amended the Food and Drugs Act. His daughter, Vanessa, died of a heart attack at age 15 while on the prescription drug Prepulsid for a stomach ailment. The medication was later deemed unsafe and pulled from the market. This story is told in detail in Young's book Death by Prescription, available on line. Vanessa's Law received unanimous support from the House of Commons. It was signed into Canadian law on November 5, 2014. The Bill's provisions can be divided into two groupings. The first of these deals with enforcement powers. Vanessa's Law updates fines and penalties to make them relevant in the 21st century. For example, the maximum fines for offenses under the Act go from a rather quaint $5000, to as much as $5 million per day for the worst transgressors. The Bill also gives the Minister of Health the authority to order the recall of products governed under the Act, bringing her powers in this area into line with those she has under the Canada Consumer Product Safety Act, the law governing the sale of virtually all other consumer products. The second group of provisions gives the Minister new powers to deal with safety concerns that might arise after a drug or medical device is initially approved for sale. These include making the reporting of adverse reactions mandatory for institutions (hospitals), authorizing the Minister to order new safety studies and authorizing the Minister to order changes to the labels of drugs and devices. All of these provisions recognize the science of post-marketing surveillance, which addresses safety issues too rare or complex to be picked up in the clinical trials that necessarily form the basis of pre-market approvals. Vanessa's Law: When is a Therapeutic Product not a Therapeutic Product?